From the outside looking in, fixed income markets had a fine year. We enjoyed positive returns, abundant liquidity, and unusually low volatility. While we still expect positive returns in 2018, we see a changing narrative informing our view of what is to come. The fact is that 2017 ended much stronger than it began. After stumbling in the first quarter, GDP is now expected to notch its third consecutive quarter of 3%-plus growth when the fourth quarter is reported, something last seen in 2004-05. Consumer spending is up and manufacturers struggle finding workers to meet a growing demand. Tax reform is expected to provide additional funds for companies to direct towards investment and higher wages. Job growth is still expanding at a pace that will move the unemployment rate down. It would be faster still but for a continuing skills mismatch between hiring companies and the unemployed. And inflation, while still below the 2% target set by the Federal Reserve, will be pressured to higher levels in the coming year. There are also the actions of the Federal Open Market Committee (“FOMC”). They undertook three rate rises in 2017 and are currently forecasting three more for 2018. They also began reducing their balance sheet in October by $10 billion/month and will work their way up to $50 billion/month by the end of 2018. This represents an aggregate $450 billion reduction over 15 months, just a 10% slice from a $4.5 trillion pie. Too slow in our view. Even so, this action alone presents a growing headwind to fixed income markets, one that we feel too many investors have dismissed. And finally, consider the composition of the FOMC, which is in the midst of an historically significant turnover on the Washington side of its power axis. Daniel Turillo – Governor resigned in April and Stanley Fischer – Vice Chair resigned in October, adding to the two already vacant seats. Randal Quarles – Governor was approved by the Senate, while Marvin Goodfriend – Governor was nominated and Jerome Powell – Chair was nominated. And Bill Dudley – President of the NY Fed and one of eight permanent votes on the FOMC, is retiring. We still await further nominations. Despite the perception of continuity by elevating Jerome Powell from Governor to Chair, he will be surrounded by a more hawkishly-minded group than was assembled before. This changing makeup will stress an organization whose already difficult task of removing accommodation will be at a critical phase in the coming year. Add all this together and the collective pressure for higher rates in 2018 is significantly greater than when we began 2017. Short rates are going up again in 2018, and long rates will follow this time. 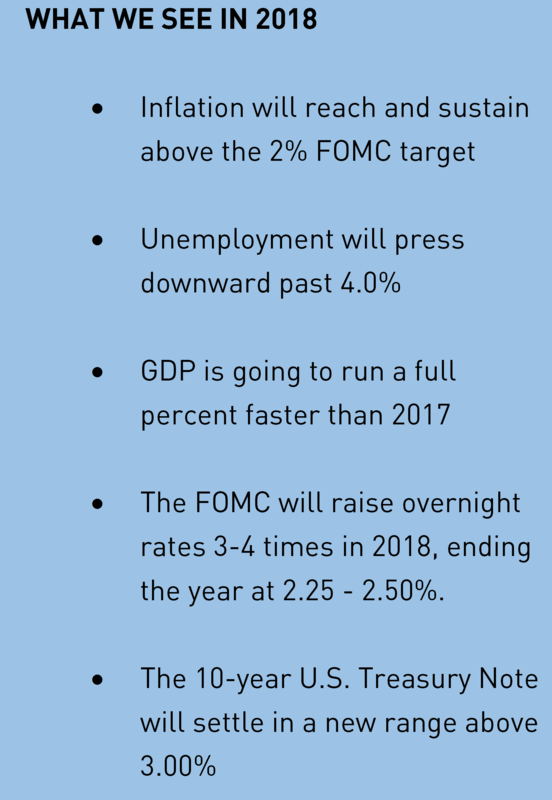 We forecast 3-4 rate rises, leading to a 2.25 – 2.50% overnight rate and a 10-year U.S. Treasury Note yielding north of 3.00%. Short duration portfolios with sound credits will best manage the conditions we expect 2018 to present, and offer the best position to earn positive returns.